OECD Secretary-General Angel Gurría welcomed Mr. Aníbal Cavaco Silva, President of the Portuguese Republic, to the OECD on Monday, 16 March 2015. On this occasion, they held a bilateral meeting, followed by a seminar on recent economic and social developments. President Cavaco Silva then addressed the OECD Council. 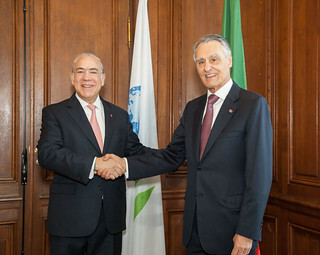 16 March 2015 - (From left) Angel Gurría, Secretary-General of the OECD and Aníbal Cavaco Silva, President of Portugal at the OECD. Paris, France.